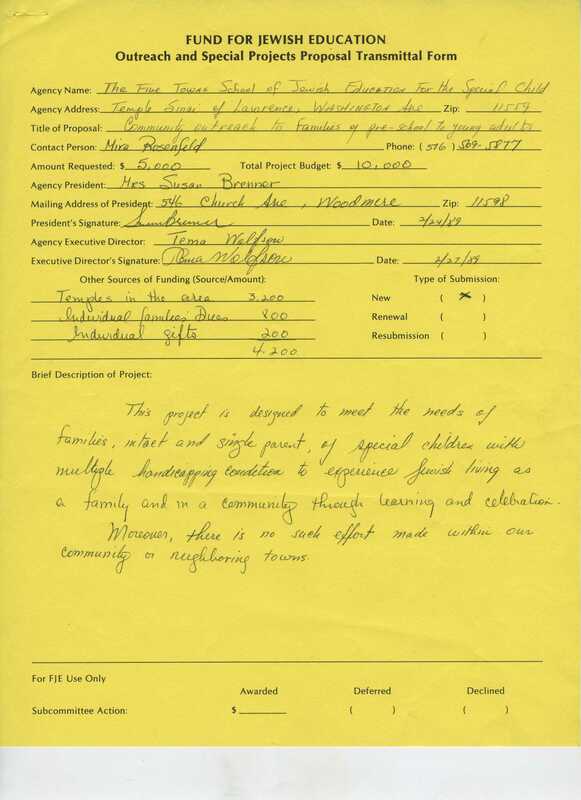 The agency proposal files are arranged alphabetically under “Fund for Jewish Education” and include agency proposals, both accepted and rejected, from 1984 to 1995 as well as general proposals from 1993 to 1995 while he served as Director of FJE. Wasserman was Director of FJE while Director of Education at UJA-Fed. 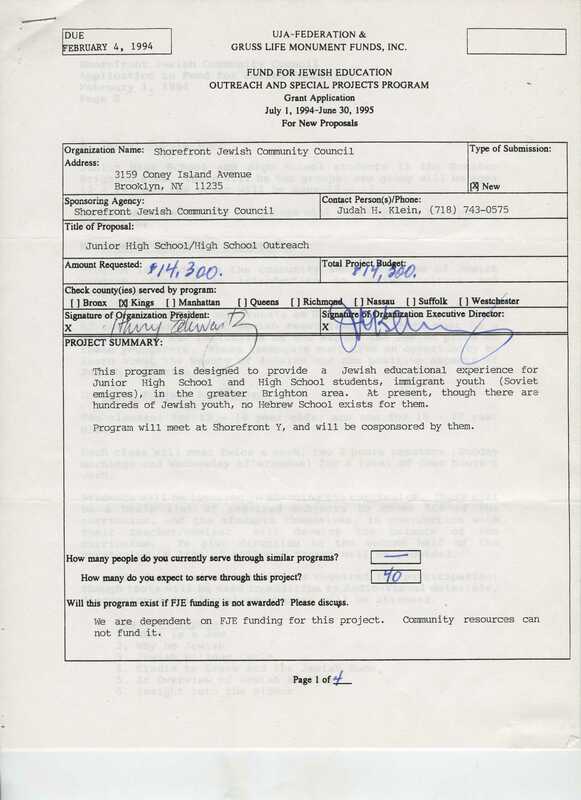 Below is a transmittal form from the Five Towns School of Jewish Education for the Special Child for a program called, “Community outreach to families of pre-school to young adults” in February of 1989, an example of the types of proposals that the Fund for Jewish Education received. Unfortunately, this proposal was later rejected. 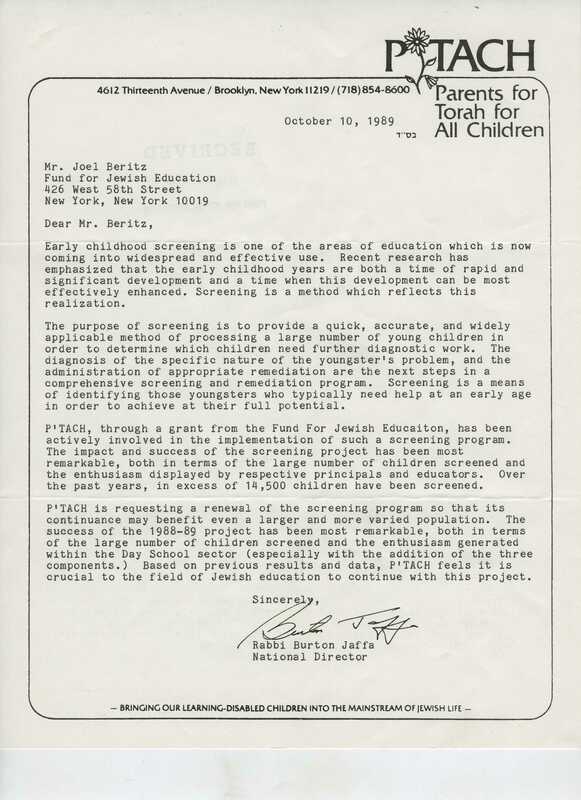 Below is a scan of a 1990 acceptance letter to Parents for Torah for All Children (P’Tach) for $25,000 for a program entitled, “Early Childhood Screening Program”, accompanied by a renewal request in October 1989 that discusses the purpose of early childhood screening. 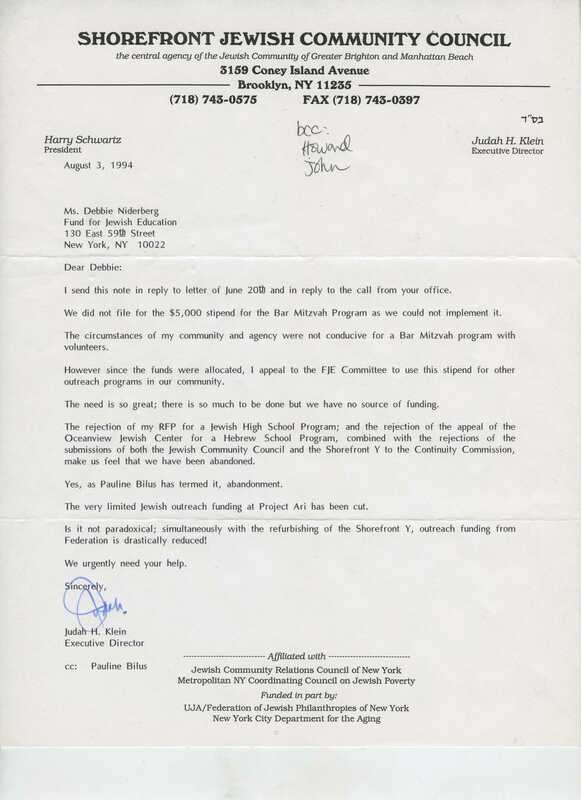 Below is an example of correspondence between the Executive Director of the Shorefront Jewish Community Council and Debbie Niderberg, Coordinator of Outreach and Special Projects for the Fund for Jewish Education, addressing the need for additional funds. Note that the first letter was blind carbon copied (bcc) to Howard Wasserman and that the second letter was on stationery where Howard Wasserman was listed as Director of FJE (Wasserman was FJE’s Director of Outreach from 1991 to 1992). 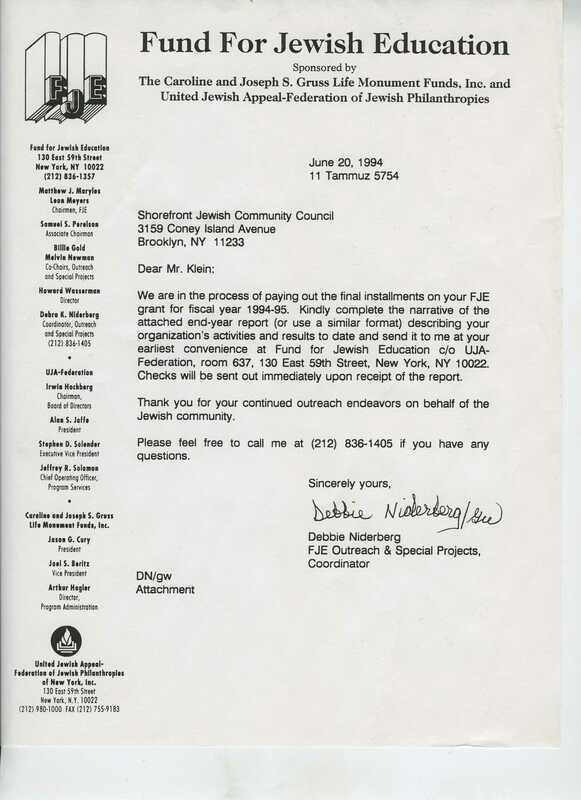 The third scan below is the first page of a grant application by the Shorefront JCC to FJE for $14,300 in the 1994 to 1995 fiscal year. 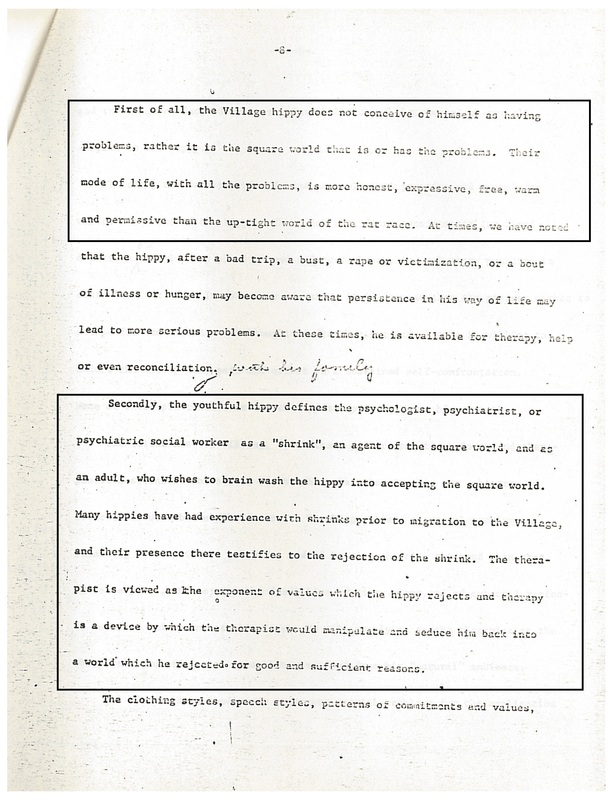 While processing the files of Stephanie Newman, a Social Planning Consultant that helped secure funding for the community service initiatives of Federation agencies in the late 1970s and early 1980s, I came across an interestingly titled project proposal in the Jewish Family Service folder: “Village Project: Therapy Training Program in Dealing with ‘Hippie’ Youth” (c. 1970). The proposal really paints a certain picture of what was going on in some neighborhoods of New York in the 1960s and 1970s. 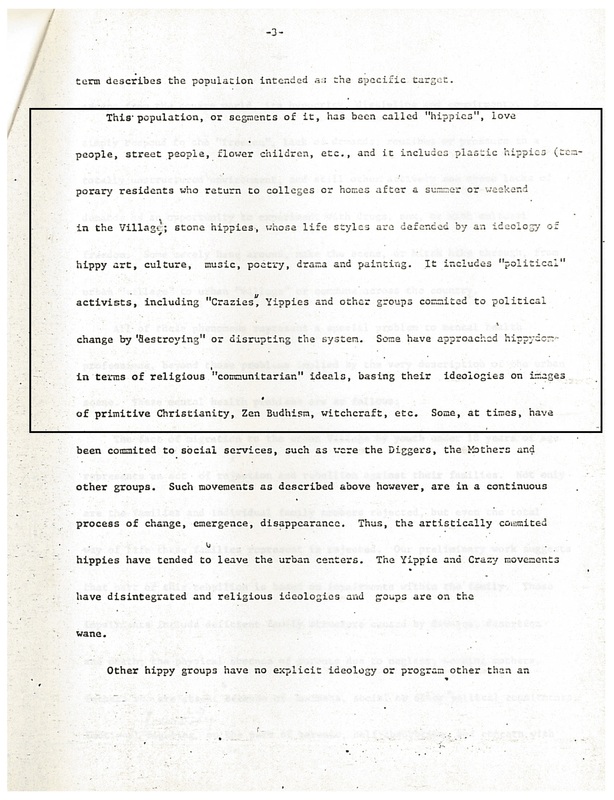 And while it does not indicate whether the project was actually funded, a separate 1973 proposal for mobile van service for youth in Brooklyn notes that “… in 1969 we set up a ‘rap’ room, reach-out storefront service in Greenwich Village of New York, with interdisciplinary staff and ‘indigenous’ youthful workers also employed.” So, it appears that the Village hippies did indeed receive some mental health services from the Jewish Family Service. In the earliest years of Federation’s affiliation with the Educational Alliance, a boy from Belarus named Peter Blume studied art at the Alliance, probably in the 1920s. Blume went on to a career as a painter, was active in the 1930s and 1940s, and died in 1992 in his 80s. In a recent review in the New York Times of a show of Blume’s work in Philadelphia, at the Pennsylvania Academy of the Fine Arts, I couldn’t help but notice that all of the photographs of Blume’s paintings are credited to the Educational Alliance. The review mentions that he also studied art at the Art Students League in New York, and that he began exhibiting his work at 18. One painting in the show was purchased in the 1940s by the Museum of Modern Art. The Alliance’s Facebook page includes a post from 2014 with a photograph of a painting and a drawing, both by Blume. It’s not entirely clear what the relationship is today between the Educational Alliance and the ownership of Blume’s paintings, but it appears that a strong bond was formed between the young boy discovering his talent for painting in a program at the Educational Alliance which was funded in part by the Federation of Jewish Philanthropies. The Urban Mass Transportation Act of 1964 authorized the New York State Department of Transportation to administer a capital grants program which provided assistance to non-profit organizations in purchasing vehicles for transportation of the elderly and handicapped. 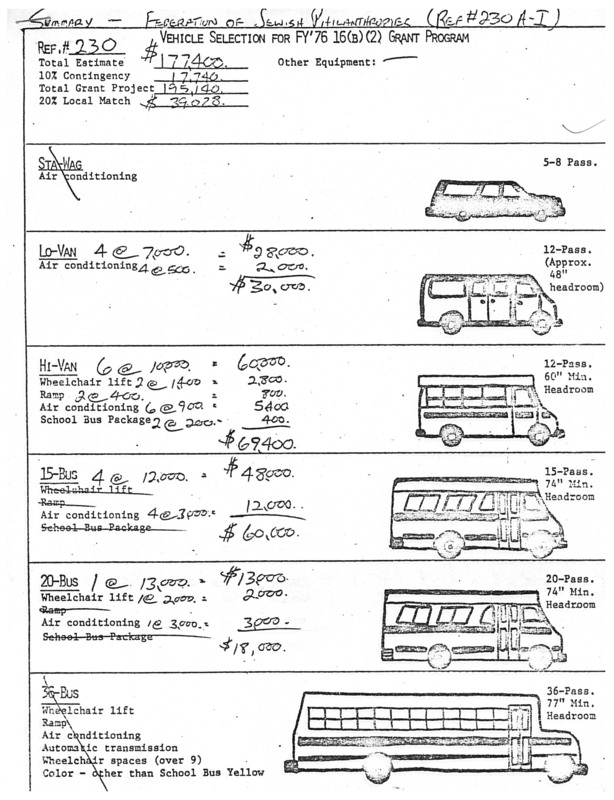 The Urban Mass Transportation Administration (UMTA, later renamed the Federal Transit Administration) provided 80% of the cost of the vehicle, and grant recipients were responsible for providing the remaining 20%, as well as the subsequent costs of operation, insurance, and maintenance of vehicles. 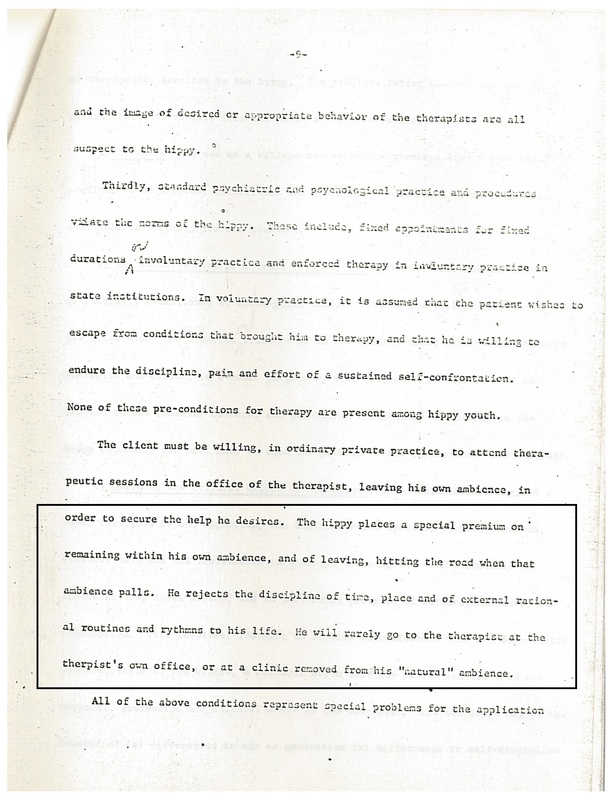 In 1976, under the direction of Social Planning Consultant Rachel Radlo Lieberman (and later, Stephanie Newman), nine Federation agencies—the Bronx-Lebanon Hospital, the Bronx House, the Bronx House Emanuel Camps, the JCC of Staten Island, the Gustave Hartman YM-YWHA, and the YM-YWHA’s of Central Queens, Riverdale, Washington Heights-Inwood, and Williamsburg—applied for and received grants to purchase a variety of vehicles. These agencies, serving all five boroughs, used vehicles to transport frail and elderly passengers, those living far from public transportation, and those needing special assistance, to Federation agency sites, to clinics, to senior citizens clubs, and to do daily chores such as grocery shopping or going to the bank. Many of the agencies still provide transportation services today. Applying for the UMTA grants was part of an initiative by Lieberman and others to seek additional sources of funding for Federation projects. 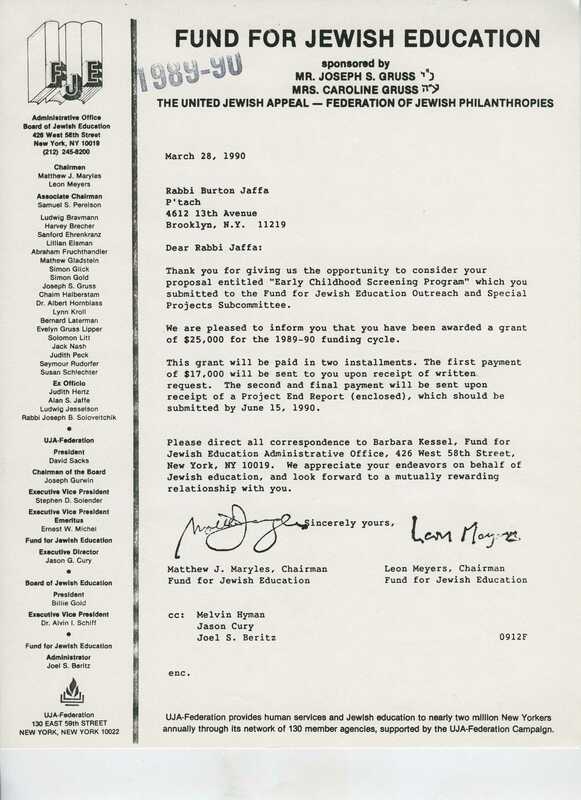 Working more with government and non-Jewish foundations, Federation sought to persuade these funding sources that they should have an investment in Jewish needs as part of the health of New York City. 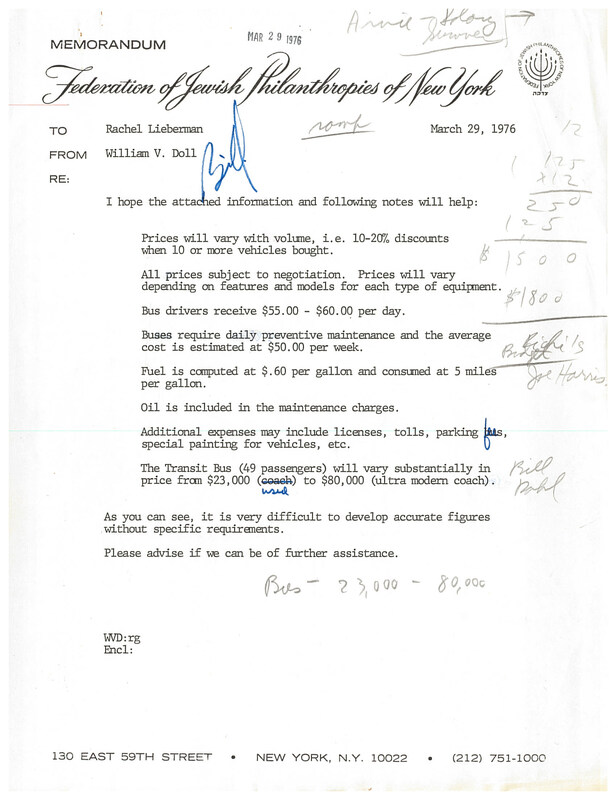 Below find information about the vehicles purchased by the nine Federation agencies, as well as rough costs of additional expenses in a memo to Lieberman from William Doll, Executive Director of the Joint Purchasing Corporation (a division of Federation that provided discounts to agencies when purchasing items such as paper, furniture, and fuel). As New Yorkers and other gather today to pay their last respects to former Governor Mario Cuomo at his funeral, I remembered having seen his image in some of the photograph sections of the collection I have processed. The portrait above is from a subseries of portrait photographs found in the Joint Campaign Public Relations files. This subseries ranges from the 1950s through the early 1980s and includes the faces of many well-known actors, musicians, and politicians, especially those based in New York. 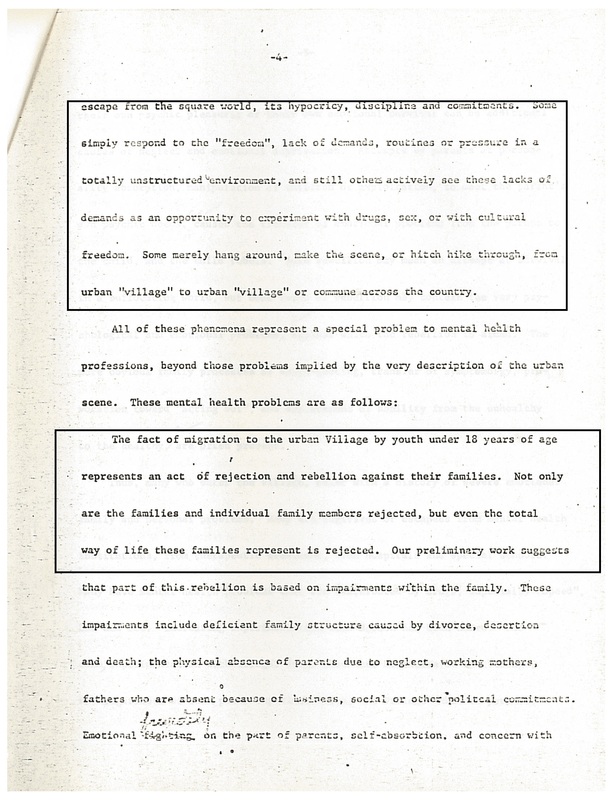 Fortunately, these portrait files were relatively well organized and in good condition when I encountered them, with the names of individuals featured in them listed clearly. When our project is complete, researchers will be able to easily search the finding aid for names like that of Mr. Cuomo and his contemporaries to see if this collection happens to hold an image of their research subject. 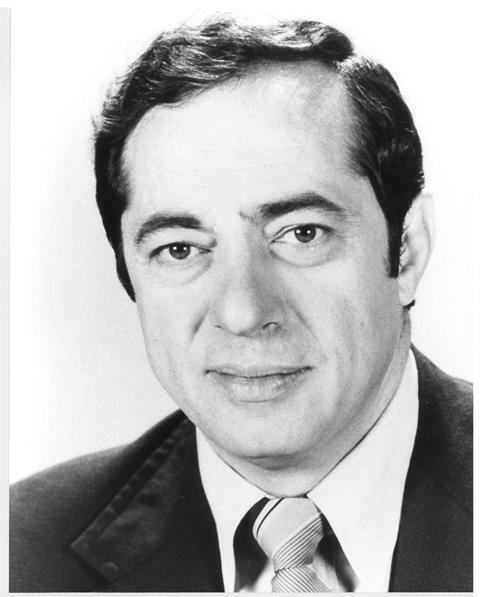 In the case of Mario Cuomo, researchers need not stop at the Joint Campaign portrait subseries; he attended quite a few UJA-Federation events over the years, especially in the 1970s when he was active in local city politics, and he appears in photographs from some of these events.